In the dry desert of southern Peru you will find the mysterious Nazca Lines, located just out of the town of Nazca, the lines remain a mystery to scientists to this day, nobody seems to know why they were made and for what purpose they served. Fortunately, the one thing the experts can agree on is how the Nazca Lines were made. As we all know, knowing with exact accuracy about things from the past is almost impossible and Scientists and Archaeologists can only guess as to the origin of some ancient ruins and artifacts, they do their best with the tools they have. However, Scientists agree how the Nazca Lines were made. 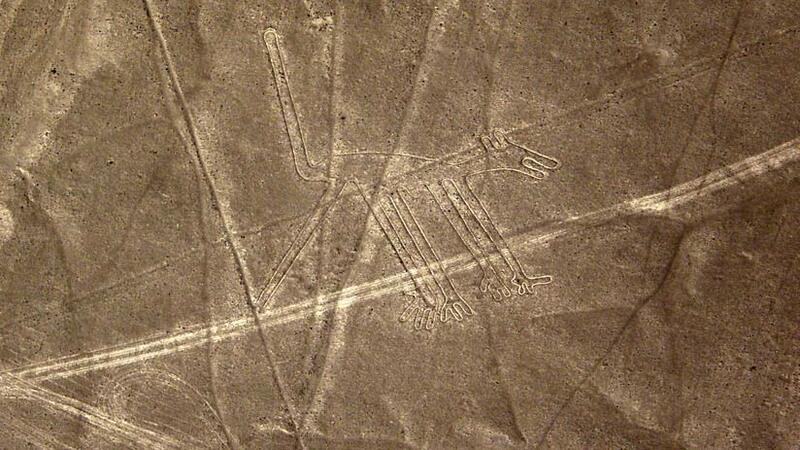 The Nazca lines are geoglyphs located in an arid coastal area of Peru that cover around 170 square miles. The lines are etched into the ground and there are literally thousands of different designs depicting creatures from both the natural world and the imagination. Theses designs feature animals such as the spider, hummingbird, monkey, lizard, pelican and a whale. There are plants such as trees, flowers and geometric shapes such as wavy lines, triangles, spirals and rectangles. 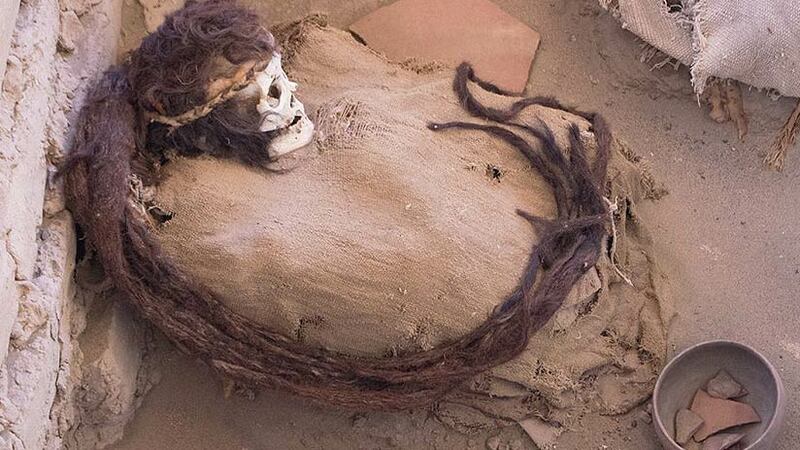 It is said that the lines date back to 200BC to 500AD, to the time when the Nazca people lived in the region. 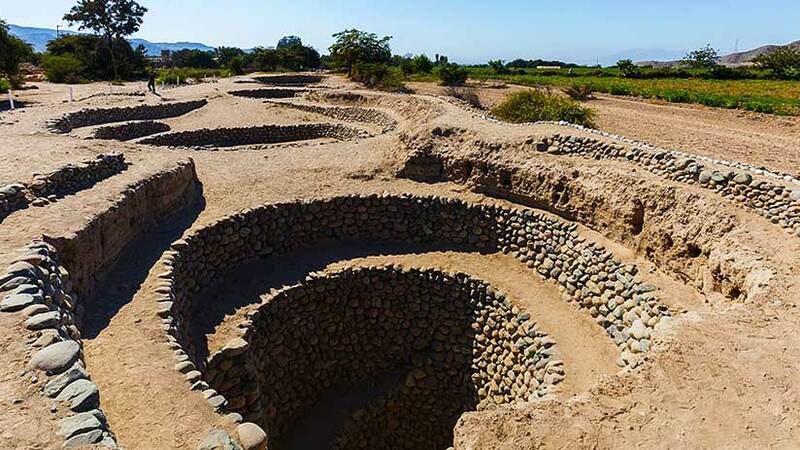 The people of the Nazca culture an ancient prehistoric culture used engineering technics to bring water to the surface for irrigation purposes. Don Proulx and David Johnson who have been working on the Nazca Lines since 1996 have found the connection between the lines and the water system below. Johnson mapped the location wells and faults that were sources of fresh water that were marked by the geoglyphs. Johnson and Proulx stated the following, ¨Trapezoids were found to lie directly over the tracks were the width of the trapezoids defined the width of the fault zone capable of transmitting ground water¨. 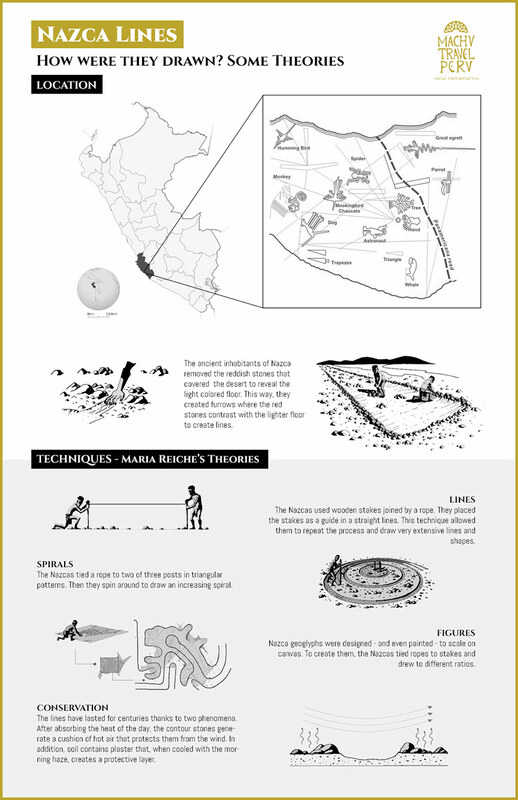 The observations led them to a new hypothesis to explain the purpose of the lines, that the Nazca Lines Peru were used as a water source and that the Nazca people relied on the lines for fresh water. Peruvian archaeologist Toribio Mejia Xesspe was said to be the first to study and report the Nazca Lines after discovering the lines on foot in the year 1927. With the increase of air travel in the 1930s the lines became better known and today attract large numbers of tourist every year. The lines are geoglyphs or drawings on the ground made by removing rocks and earth to create an image. The desert floor has weathered over thousands of years so when the upper rocks were removed they reveal a light sand colored rock, the light colored rock is how we see the lines. Because of the dry climate, the lines have been preserved for more than 500 to 2000 years. 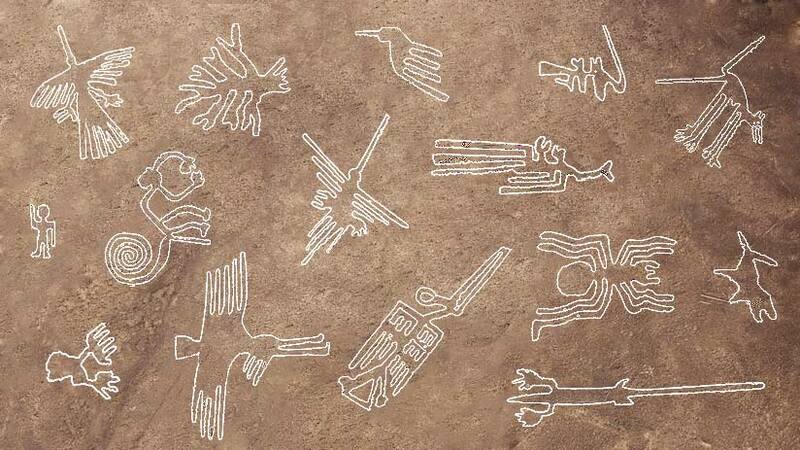 Scientists believe that the lines were made by the Nazca people, from around AD 10 to 700. The lines are located around 200 miles south of Lima, the area features 800 straight lines, 300 geometric figures and 70 animal and plant deigns, some of the lines are around 30 miles long and some are 1200 feet in length. 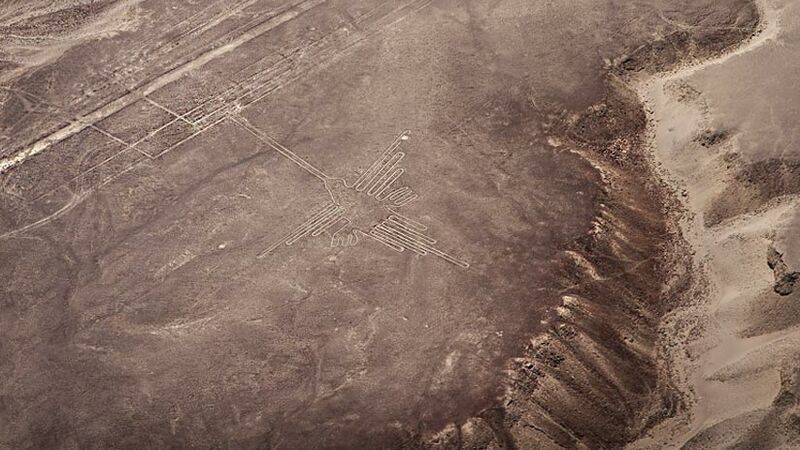 The best way to see the Nazca lines is by plane, this way you will see the lines distinctly. In addition, you may go to the viewing tower located outside the town of Nazca, from the tower you will see a few figures and it will cost you a few soles. In the 1940s American Professor Paul Kosok investigated the lines, when the sun was setting he noticed that the sunset was in direct alignment with the lines, he called the lines the largest astronomy book in the world. Kosok was succeeded by German scientist Maria Reiche, who was later known as the lady of the lines, she dedicated 40 years of her life to the study of the lines. Her theory was that the lines were for astronomical and calendrical purpose. She fought hard to protect the lines and even lived just outside the site to keep an eye on her project. The flight over the lines can be taken from the airport in Nazca or the airport in Paracas, which is north of Nazca. On your Paracas Peru tours, you can also visit the fascinating Ballestas Islands and see the thousands of varieties of birds. Also, see the sea lions lazing in the sun. Whether you have a luxury tour or budget tour budget, you will find something for you in the Nazca area. The mysterious Nazca Lines are waiting for you to discover, you can take the hair raising plan ride, or see the lines from the observation tower located outside of the town of Nazca. 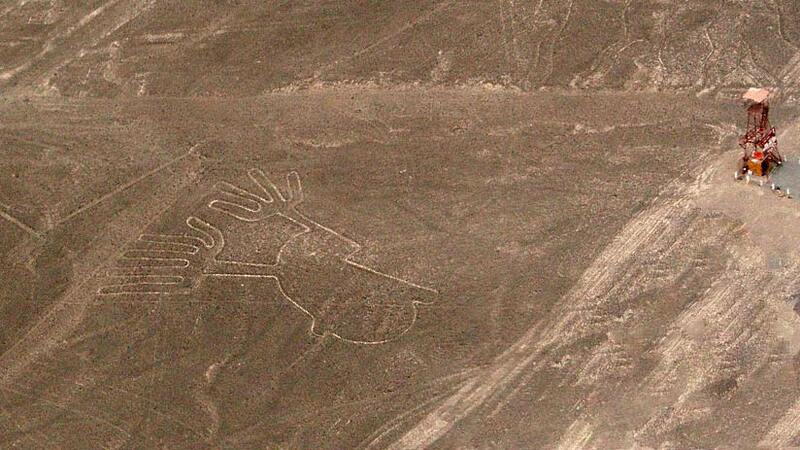 Come and see the Nazca Lines in the desert in Southern Peru, something that should be on your bucket list. Do not forget to see the rest of Peru and the incredible history that the country offers. Travel To Peru adventure, culture. permalink. Travel Dilemma in Peru Group or Individual Tours?